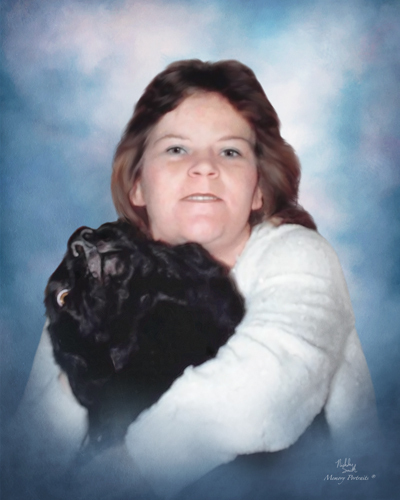 Cheryl Gail (Kurtz) Smith, age 61, of Evansville, IN, passed away at 11:00 p.m. on Tuesday, January 15, 2019, at home. Cheryl was born March 3, 1957, in Owensboro, KY, to the late James and Alpha (Hudson) Kurtz. She attended Henderson City High School. Cheryl enjoyed crocheting, watching wrestling, and playing on her tablet. She is survived by her husband, John Smith; sisters, Anna Demarest (Kenny); Annie Hunt (Chuck), Nannie Keene; many cousins, nieces, and nephews; and dog, Maylor. She is preceded in death by her parents; sister, Dorothy Kurtz; and brothers, James Kurtz, Jimmy Kurtz, and Anthony Kurtz. Graveside Services will be held at 1:00 p.m., Monday, January 28, 2019 at Bethel Cemetery in Beech Grove, KY with Pastor Steve Clayton officiating.